If you’re a subject matter expert who hosts live webinars, like I do, you know all the problems with webinar technology. You accidentally click the wrong button on the console and discover that for the last 10 minutes, your audience has been unable to hear you. Or you struggle to present in-depth content while keeping one eye on the box where questions from the audience appear. Or you hear bad feedback in your headset and don’t know how to make it go away. Or—and this is the worst one—a thunderstorm storm rolls through your area and knocks out electricity halfway through the call. The ongoing problem I face is taking the time to promote all the recorded webinars I sell as products. I’m usually so busy creating and promoting the next one, that the ones I recorded even a few months ago don’t sell as well as I’d hoped. He coined the phrase “Hybrid Webinars” because they’re a combination of a recording, with a live Q&A. Here’s how it works. You choose a topic your audience will love and offer a free or paid call. Tom offers almost all of his for free and often gets several hundred people to register. He presents content, takes questions and records the call. At the end, he makes an offer for a product or service. Several weeks later, he offers a rebroadcast, often on a Saturday morning when his schedule is more open and when people have more time to watch and listen. But he’s available during the rebroadcast to answer questions live. 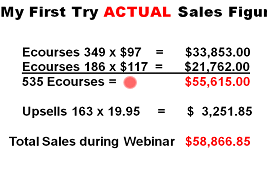 Note that the $58,866.85 figure is only part of the money he made during this first webinar. The video includes other slides that show additional revenue earned by doing other smart things during the webinar. It helps that Tom markets these webinars to an email list of more than 60,000 people. But even if your list is far smaller, you can see that you, too, can easily start bringing in more revenue from these calls than if you were to simply record the webinar and sell the replay with no live Q&A. Jeff Herring, one of Tom’s students, hosts these Hybrid Webinars, too, and actually answered questions during one replay while he was away from home at a speaking engagement! In fact, you can even answer questions while you’re on the beach, using your mobile phone. 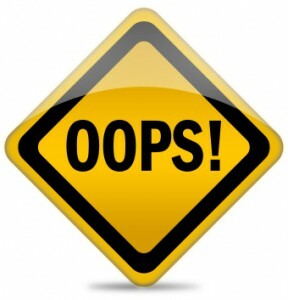 Tom explained ethical considerations, shortcuts, marketing tips, and techie tips. He showed us how he uses a dirt-cheap program (I use it too) that lets you create macro keys with answers to frequently asked questions. So with just a few keystrokes, you can give a lengthy answer to a question without having to retype the answer every time. I’m On Board, How About You? I hope to start recording free or paid webinars soon using Tom’s system. I’ll check back with you to let you know how it’s working for me. After you watch his webinar replay, weigh in here with your comments on whether you think this would work for your business model. Your link to Tom’s free replay goes to a page that requests a login ID and password. That’s correct. You must log in to see the replay. Trust me. It’s worth it. The webinar was fabulous. I see that I got confused by the word “login.” Normally that’s used when someone has already signed up. The signup page drove me away because it looked like it was for people who already had signed up before. A good usability lesson here.